Mathematics is an exciting world that not only deals with problems or proofs but also involves human activities, experiences, patterns, ideas, theorems, corrections, assumptions etc. The mathematical theorems are taken highly important when you are preparing for the higher studies or any competitive exam. When we deal with theorems, it states that statements, proofs, and whatever we remark in mathematics are meaningless if it is not accompanied by relevant proof. Theorems are the statements that are demonstrated by some proven mathematical arguments and operations. In the field of mathematics, Stewart’s theorem is a popular name that states the relationship between the length of sides of a triangle and its median. The theorem was named after a famous mathematician Stewart in the year 1746. This is clear that the Theorem was proposed a long time back and still popular and useful. 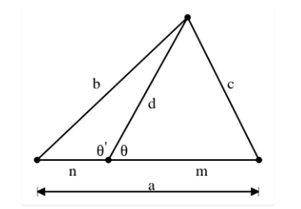 This is easy to prove the Stewart theorem with the cosine laws or drawing the perpendicular from the vertex to the base of the triangle by using Pythagorean Theorem to write the distances b, d, and c in terms of the altitude. Now, the right or left sides of the equation will reduce algebraically to derive the same type of expression.The theorem is wisely popular in the mathematical world in terms of versatility by solving tough geometrical problems. This is not easy to learn theorems in maths but you need to study the mathematical language by heart to learn something new. Try to understand the problem in depth and derive the solution accordingly. Once you are able to formulate the idea of the Theorem then you are almost done. Read the statement of the theorem carefully that you want to memorize and learn in the simplest way. Ask a plenty of questions for yourself because it always makes the learning easy for you. After one or two attempts, you would be able to demonstrate the theorem by heart. The other best style to learn theorems is diagrams. Understand the diagram for each theorem carefully and what is the meaning of sides and median here. Everything is connected somehow in mathematics and gives you an idea of moving ahead. You just have to follow the right path to solve the problem. So, what would be your approach to solve the problem in mathematics? Trust me, there is no magical trick but this is your passion and the right approach that can make you an expert. Don’t memorize the theorem but try to learn tricks and techniques that could make the learning easy for you.